One Piece: World Seeker is an action-adventure game based on the long-running One Piece manga and anime series. My first exposure to One Piece was with the fighter One Piece: Burning Blood. World Seeker is the first game in the franchise to feature a full open world environment. The game's setting is Jail Island, which is part of the New World. Throughout the game, you'll run into many of the Straw Hat crew. World Seekers has its own unique story that is separate from the manga. 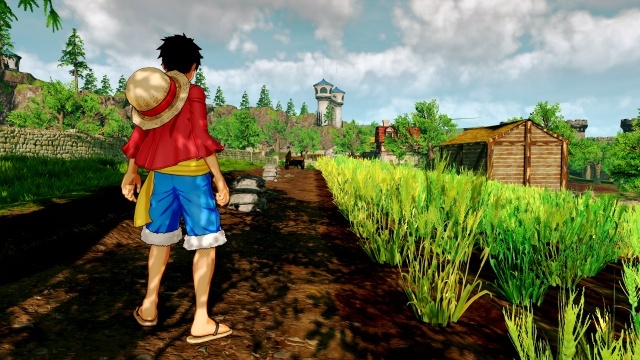 Players take on the role of Monkey D Luffy and get to explore a huge island with several towns and other areas. Luffy has two modes of attack. He can switch between a lighter form of attacking where he stretches his limbs and is more agile and a heavier form of attack which is more damaging and slower. You have a basic three hit combo with each attack type and you can unlock more attacks and abilities through the skill menu. Luffy can also perform stealth attacks on enemies and hide in barrels to sneak by them. Skill points are gained from defeating enemies and they can be used to unlock skills on a grid in the menu screen - it's sort of like a much smaller Final Fantasy X sphere grid. Luffy can unlock abilities that allow him to traverse the world faster and perform different types of attacks. He also has a view that allows him to see through objects to find enemies and items. By stretching his limbs, Luffy can grapple onto buildings to reach higher areas - this helps out in climbing buildings. All of Luffy's moves are animated extremely well. World Seeker has tons of eye candy in its animations. Cutscenes that introduce characters or have some type of important event in them have some great sequences. The entire game is in Japanese dialogue with English subtitles. A good amount of the cutscenes only have character sound effects along with text dialogue, but it works out quite well for the sheer amount of dialogue in World Seeker. A good amount of the time, you'll engage in conversation when meeting up for mission objectives. Players will engage in main missions and side missions as the story progresses. From the start, you mainly find story missions but the game eventually branches out into smaller missions. So much of the game has repetitive missions that you'll become all too familiar with. A good bit of the smaller missions are simply fetch quests where you have to find certain items to give to a person for a special item in return. Main missions often involve meeting up at a location to engage in conversation then branch out into another meet-up point for some more conversation. Along the way in between missions, you'll run into enemies to fight and there are a few boss enemies every now and then. World Seeker's overall open world is huge and the overall space is filled with a bunch of emptiness. While traversing the world, I ran into mainly lifeless open spaces everywhere I went. I would sometimes spend a good amount of time trying to find one certain important character in a huge area and would have trouble because of how big the area was. Missions sometimes highlight an area on the map where you should find a certain person and that area is a lot bigger than it looks on the minimap. Even towns can be annoying to go through. You have these super tall buildings with only one item on top of them or nothing at all. Thankfully, there are many people to talk to in each town, but they don't have much useful dialogue to share. 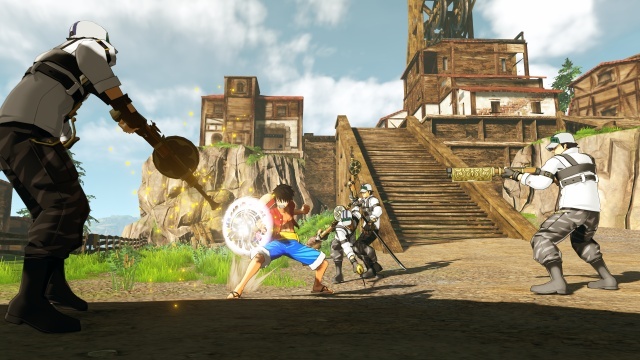 World Seeker's open world has tons of items to collect but many of them are simply normal items that have little use. There are also treasure chests to find. Luffy does gain abilities that allow him to traverse the environments faster and you do gain access to a fast travel, but all of this is still not enough for such huge environments. Prepare to spend several minutes getting to destinations even with help. Even with One Piece: World Seeker's problems it can be fun to play once you get into the main story missions. The cutscenes are entertaining and the game has good character dialogue. It starts to get more interesting once more characters are introduced. Fans of the One Piece franchise will most likely enjoy the game for what it is much more than I did, but I don't see how you can ignore the gameplay flaws. The game really needs more options for exploration and more to do in its environments. Final Rating: 60% - Even with great characters, World Seeker's open world is too full of emptiness to enjoy.